Get ready to spice things up! 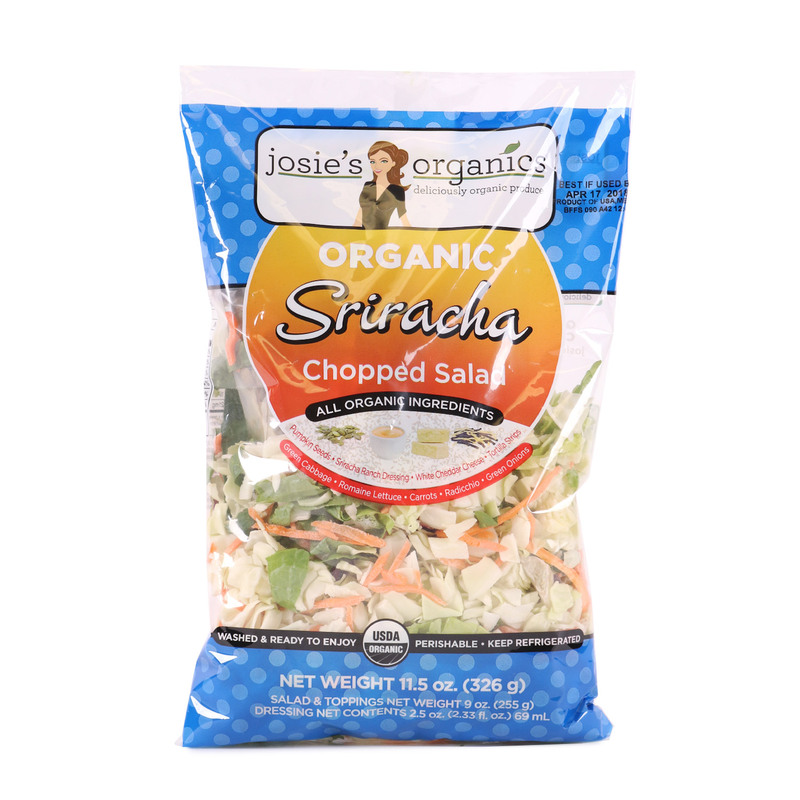 This Sriracha Chopped Salad is a flavorful blend of fresh green cabbage, romaine lettuce, carrots, radicchio and green onions. Pumpkin seeds, white cheddar cheese, tortilla strips and Sriracha ranch dressing add a burst of flavor and spice to this complete salad kit. Combine with udon noodles for a hearty side dish, or add to your morning omelet for a jump start on your day. 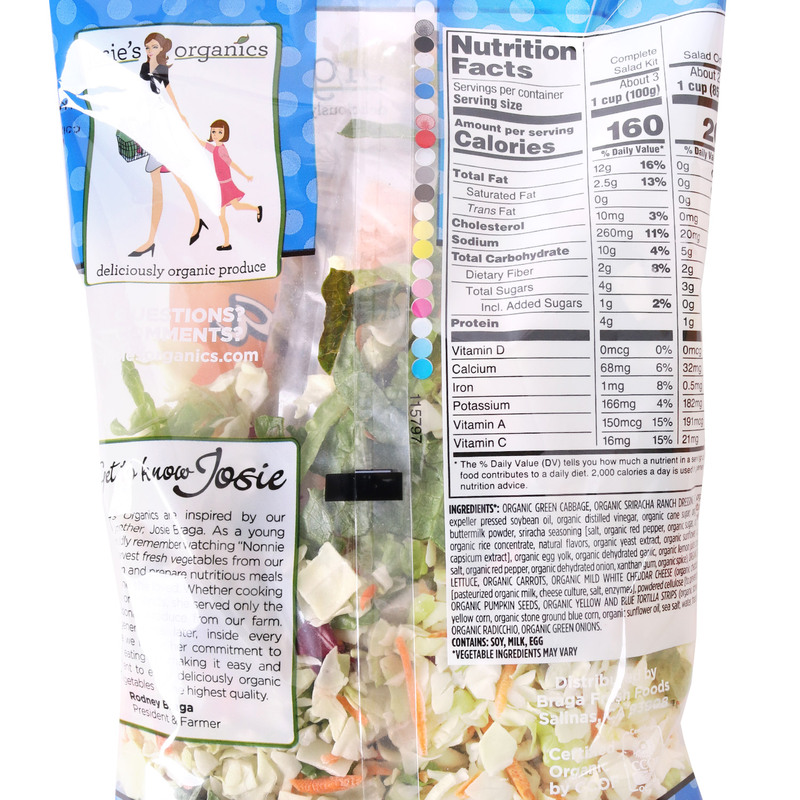 This complete salad kit makes it quick and easy to make creative meals in minutes! Organic green cabbage, organic Sriracha ranch dressing (water, organic expeller pressed soybean oil, organic distilled vinegar, organic cane sugar, organic cultured buttermilk powder, Sriracha seasoning [salt, organic red pepper, organic sugar, organic garlic, organic rice concentrate, natural flavors, organic yeast extract, organic sunflower oil, organic capsicum extract], organic egg yolk, organic dehydrated garlic, organic lemon juice concentrate, salt, organic red pepper, organic dehydrated onion, xanthan gum, organic spice), organic romaine lettuce, organic carrots, organic mild white cheddar cheese (organic cheddar cheese [pasteurized organic milk, cheese culture, salt, enzymes], powdered cellulose [to prevent caking]), organic pumpkin seeds, organic yellow and blue tortilla strips (organic stone ground yellow corn, organic stone ground blue corn, organic sunflower oil, sea salt, water, trace of lime), organic radicchio, organic green onions.